A special audio presentation of the magnificent #1 New York Times bestseller! Featuring William J. Bennett, Elayne Bennett, Charlton Heston, Dana Ivey, Joe Morton, Tonya Pinkins, Faith Prince, Tom Selleck, Harriet Walter, Fritz Weaver, and Michael York. An audio program for the whole family. Responsibility. Courage. Compassion. Loyalty. Honesty. Friendship. Persistence. Hard Work. Self-Discipline. Faith. Everyone recognizes these traits as essentials of good character. In order for our children to develop such traits, we have to offer them examples of good and bad, right and wrong. And the best place to find them is in great works of literature and in exemplary stories from history. 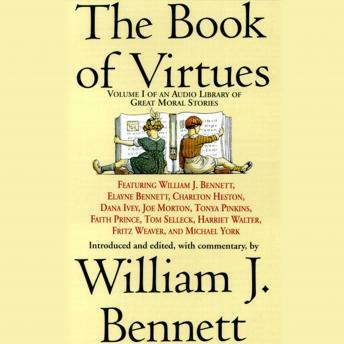 In this special audio presentation of The Book of Virtues, William J. Bennett presents a selection from his bestselling anthology of stories that has inspired and instructed readers of all ages from coast to coast. From the Bible to fables to Greek myths, from ancient philosophy to American history to unforgettable words of our nation's leaders, here are the timeless works that will help children understand and develop character -- and help adults teach them. A rich mine of moral literacy and a reliable moral reference point, these stories will help anchor our children and ourselves in our culture, our history and our traditions -- presented in a unique audio program that the whole family can enjoy, and learn from, together.